Hearing and listening are two very different things, and it’s within this difference that many learning difficulties arise – not just in nursery and primary, but also secondary and beyond. Children often assume that if they’re sitting quietly, they’re listening, but how much of what’s just been said by teacher has actually registered? Some children, it seems, are naturally good at becoming engaged, while others will, quite possibly unintentionally, use teacher instruction time as their cue to daydream. The trick is to get children tuned in – and it’s never too early to start. Keeping things fun is always the best way to grab attention. Try out some of the following tried and tested games, using concentration skills to engage children and keep them on task. Once you’ve secured their concentration the listening becomes automatic. 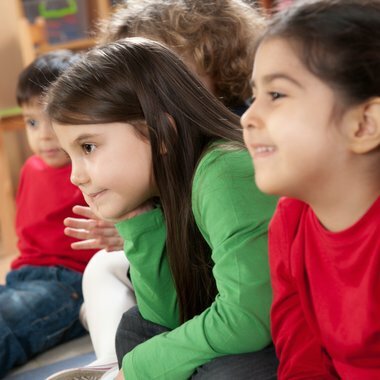 Storytelling naturally encourages listening skills, and one of the best ways of focusing attention at storytime is by telling repetitive stories and rhymes. This allows children to follow the story, listening out for and joining in with the repetitive sections. A good story to use is The Gingerbread Man, where children can try to remember all the characters trying to catch the gingerbread man, calling out the list of names. Children need to concentrate to remember everyone in the correct order, and they love the challenge. I’m going to add one or two more prominently to my planning re: learning through sounds/themed activities. Many of these ideas I was familiar with already but I scanned through and picked up a couple of things like the memory matching game using old cards cut in half. Thanks for this simple idea and recycling tip! I was also delighted to come across the idea of filling icecream cones with fruit. I bought some half price recently and was wondering what I could do with them that would be healthy. There is so much that could be done with this to improve their listening skills, comprehension, vocabulary and mathematical skills. Thank you!